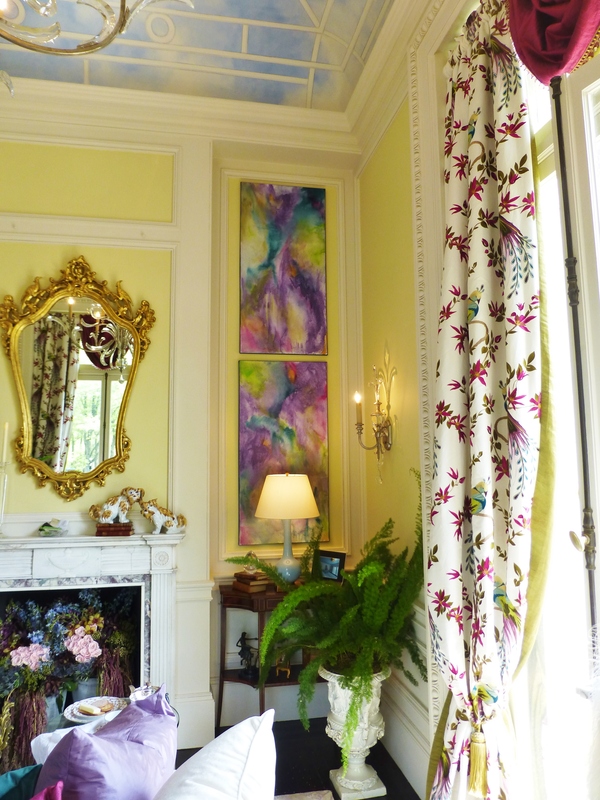 A small fireplace mantel has a shapely mirror placed above, and contemporary artwork enhances the corner. Today on Kristine Robinson’s Blog, we’ll revisit Blairsden, the Mansion in May. My son, Grady, and I had such a lovely tour at this estate earlier this month, and I was able to snap many fantastic photographs, both inside and outside the amazing Mansion. I’ll continue to share them with you over the next several weeks. This time, we’ll be looking at two spaces just to the right of the entrance called “A Room of Her Own” and “Finishing Touch”. “A Room of Her Own” was designed by Timothy and Associates Interiors Design (Timothy G. Miller). Mr. Miller designed the space for an English female novelist, similar to Virgina Woolf, as a private escape for the creation of art. The space was created to stimulate creativity due to its beauty and purpose with a writing desk for composing poems or novels. Beautiful saturated colors are featured in this stimulating space. Notice the hand-painted ceiling and bold-colored pillows on the sofa. A taxidermy peacock is placed in the window (a popular theme at this year’s house). 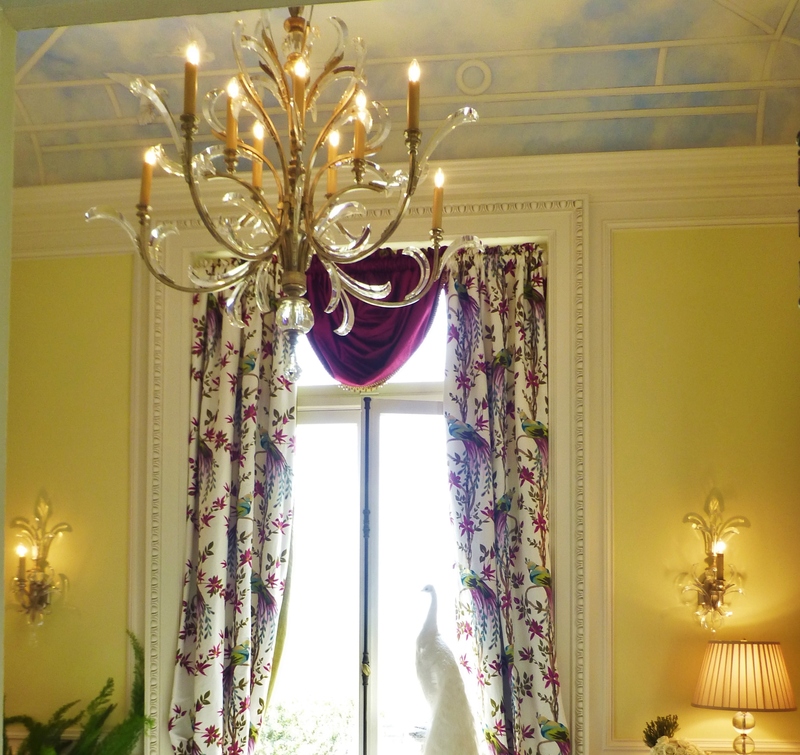 The room features a luxurious contemporary crystal chandelier and sconces, and a beautiful writing desk in the window. You’ll also notice the stunning draperies featuring a wide variety of colors, including fuscia, greens, and yellows with peacocks. Isn’t this chandelier and the matching sconces just amazing? 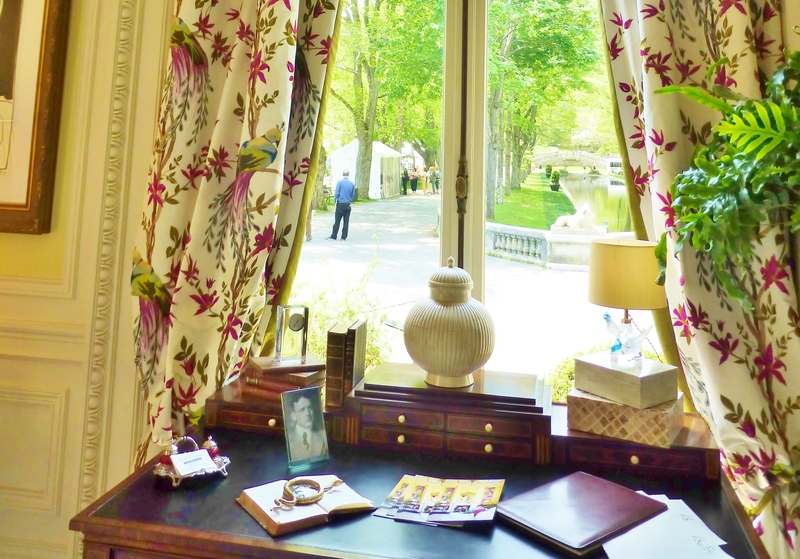 The petite writing desk is positioned at the window (Just as I like it!). The view is of the long pond at the entrance to the home. Let’s move on to the adjacent powder room, shall we? The room is named “Finishing Touch’ and was designed by Susan Obercian Design and Van Cleef Tile & Stone.This small, but impactful space is clean, elegant, and serene. 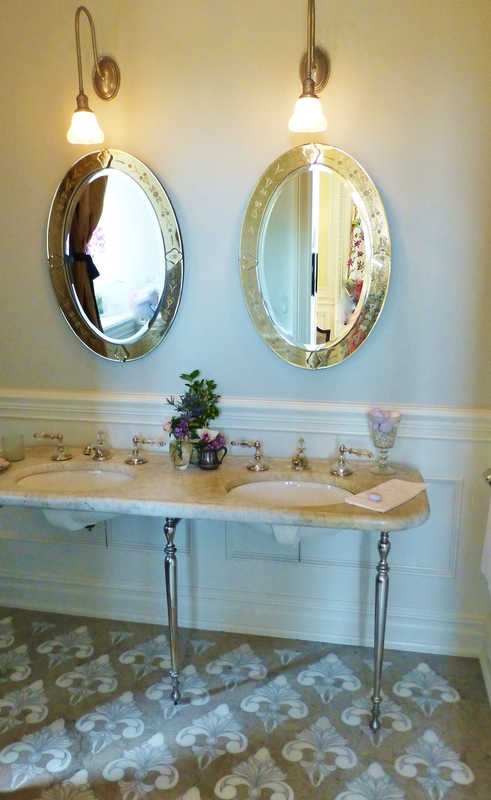 This serene powder room is just outside the office of the lady of the house. The paneling is elegant, the colors are inviting, the lighting sparkles and the accessories are beautiful. 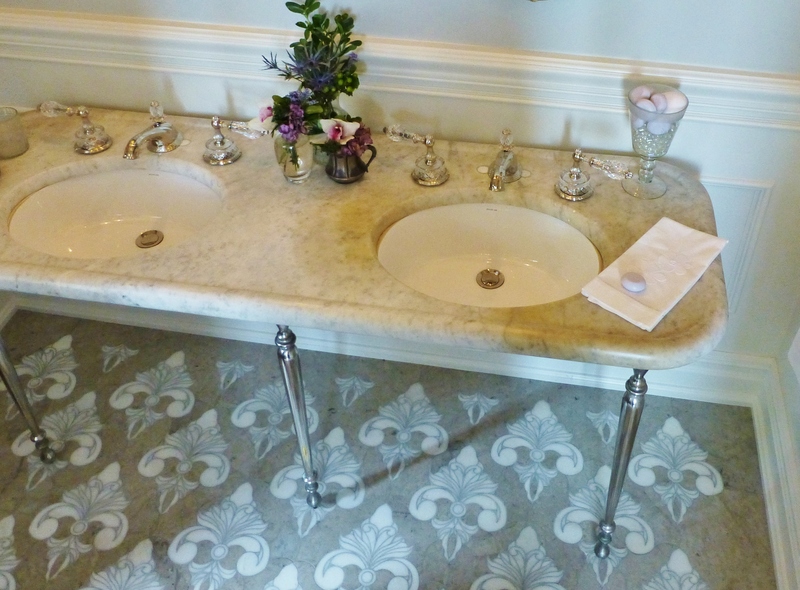 Notice the original Carrera marble double vanity, which has been restored. The star of the room is the custom-designed marble and limestone floor inspired by materials original to the house. Please take the time and leave me a comment about the rooms featured in this week’s blog–did you love the colorful “Room of Her Own”? And what did you think about that custom tile floor in the powder room? 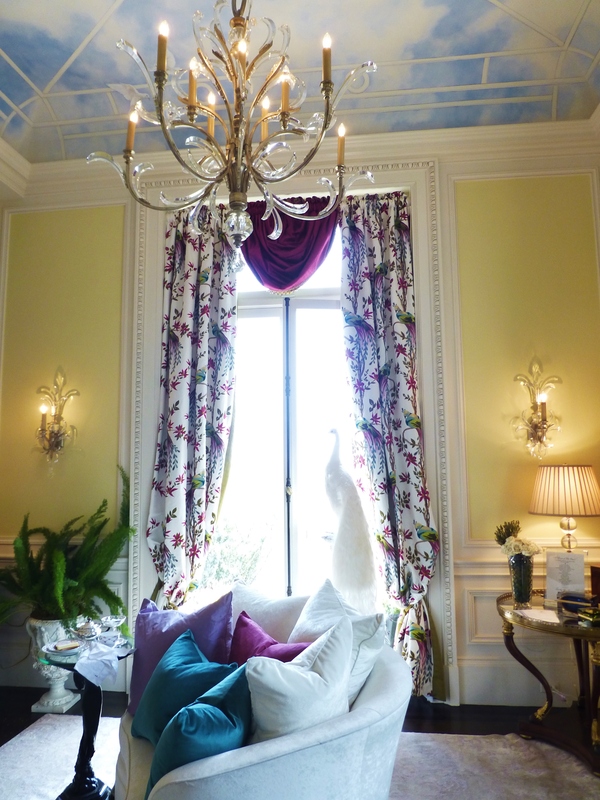 Stay tuned for much more about the rooms in Blairsden: The Mansion in May. Until then, please tell everyone you know about Kristine Robinson’s Blog, I need all the friends I can get! This entry was posted in Architecture, Color, Designer House, Home Decor, Interior Design & Decorating, Window Treatments and tagged Antiques, artwork, Chandelier, Decorating, Designer House, Desk, Fabric, Fireplace, Furniture, Interior, Interior Design, Mansion in May, powder room, Tile. Bookmark the permalink. Such a beautiful place to be! Well written Kristine. I enjoy your view of things, I learn a lot!